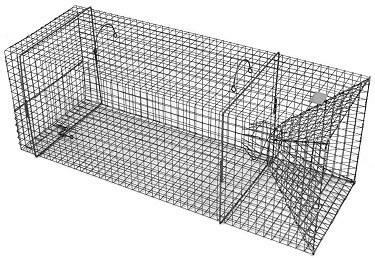 Extra Large Fish Trap, Model 406, is a heavy duty repeating fish trap that measures 15" x 15" x 42". It has one large trap door located at the front of the trap and a convenient release door located at the back of the trap for easy access to the fish. Extra Large Fish Trap, Model 406, is a heavy duty repeating fish trap that measures 15" x 15" x 42". It has one large trap door located at the front of the trap and a convenient release door located at the back of the trap for easy access to the fish. The special 5" circular funnel design of the extremely large trap door directs the fish into the trap as they swim upstream. Fish keep swimming in, but they can't swim out. Construction of Grid = 1" x 1"
Also manufactured is a special pair of wings that can easily be added to the front entrance of the trap. The wings act as an extremely large funnel system the reaches out 42" on each side. This greatly increases the number of fish funneled into the trap. A pair of wings can easily be installed on location. 9/29/2011 – Is there any option to enlarge the opening for larger fish. I am trying to thin my pond out of bream. I need a bit larger . . .